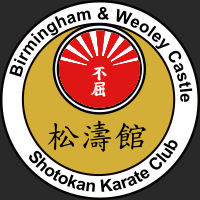 Birmingham & Weoley Castle Shotokan Karate is one of the longest running karate clubs in the West Midlands. Originally founded in 1968 by the late Shihan Cummins 8th Dan as what became known as Birmingham & Halesowen Shotokan Karate Club with a dojo in Weoley Castle from the early days it grew from strength to strength producing many well regarded karate-ka and instructors as well as many National, European and World Champions. The clubs Alumni include Sensei Ronnie Christopher, 6th Dan and former double World Champion, Sensei Ronnie Canning, former World Champion, Sensei Slater Williams, 7th Dan, the late Sensei Franklyn Doras, 7th Dan. In 2012 Shihan Cummins gave what was then the longest running dojo at Weoley Castle which had run at its current location for some 37 years to his student, BHSKC Club Secretary and Welfare Officer, Sensei Susan Hession who had taught by his side for many years to form Weoley Castle Shotokan Karate Club. This initially operated under the BHSKC group with Shihan Cummins as Chief instructor before becoming fully independent with Sensei Hession as Chief instructor but maintaining its link with BHSKC. Weoley Castle Shotokan Karate grew strongly under Sensei Hession producing a number of students who in turn had their own share of success at competition. Shihan Cyril Cummins passed away in 2017 passing on the mantle of Chief Instructor of Birmingham & Halesowen Shotokan Karate Club to Sensei Hession. Since then the two clunbs have operated in conjunction with each other under her stewardship maintaining their individual names but under a combined badge. as BHSKC & WCSKC. However time waits for no man and during this time training locations have changed with some long standing dojos like Bartley Green and Halesowen closing so to embody this new era and reflect changes in the geography of the club we are adopting a new name and badge, Birmingham & Weoley Castle Shotokan Karate (BWCSK). Students from Birmingham & Halesowen and Weoley Castle have progressed well through the grades and have done very well in kata and kumite tournaments over the years producing many regional, European and World Champions. We hope to continue this long standing tradition under the new name of Birmingham & Weoley Castle Shotokan Karate. Joining Birmingham & Weoley Castle Shotokan Karate Club opens up a variety of options with classes on Monday, Wednesday, Thursday and Saturday with Sensei Sue and the BWCSK team. Birmingham & Weoley Castle Shotokan Karate club is governed by NAKMAS an association for martial arts clubs. NAKMAS provides insurance for every student and instructor. All instructors and assistant instructors are enhanced DBS checked before being issued with a licence to teach. To learn more about NAKMAS please click on the NAKMAS image. Shotokan Karate was originally developed by Sensei Gichin Funakoshi who used the pen name Shoto which means waving pines. Through the ages it has evolved as body shapes have changed and laws no longer allow us to settle our differences in combat. However our club and associated clubs belonging to NAKMAS pride ourselves in discipline and form. Our Chief Instructor Sensei Sue Hession, 4th Dan, has learned from the best: the late Shihan Cyril Cummins, 8th Dan, founder and chief instructor of Birmingham and Halesowen Shotokan Karate club dojos.